I'm very pleased to have author Molly Noble Bull come tell us about her books. Her upcoming release, Cinderella Texas, has been delayed by Hurricane Sandy, but Molly still has a lot to tell us about the book, about her other projects and about herself. Molly, you have had several books published. Tell us just a bit about them. How are they alike? How are they different? Is there a common thread running through them? I’ve always been known for writing what some call heartwarming Christian novels. One editor once wrote, “What makes Molly Noble Bull’s books different from some is the humor.” My long historical, Sanctuary, won the 2008 Gayle Wilson Award and tied for first place in the 2008 Winter Rose contest, both for published authors in the inspirational category. Sanctuary was set in France in 1746 and is about the Huguenots, and it had a more serious tone. Yet even in that novel, there were light moments that I hope made my readers smile. However, I wrote one book that was really different from what I normally write because it is true. The Overcomers: Christian Authors Who Conquered Learning Disabilities is a non-fiction book written by five published authors. I wrote most of it, but one of the other four authors is Margaret Daley, current president of ACFW. Yep, we all struggled with learning disabilities, especially in elementary school. I was dyslexic then and still am today. And yet with God’s help, all five of us overcame. That's wonderful that all of you overcame your disability and became successful authors and even more wonderful that you have shared your experiences so others can benefit. Regarding your fiction books, how is your new release Cinderella Texas different? What makes it particularly special to you? What makes Cinderella Texas different is that the publication date was delayed because of Hurricane Sandy, the monster storm. Now I don’t know when Cinderella is coming out. My book publisher moved to higher ground, and I don’t know when he will be able to return to his office. I don’t even have a copy of my cover yet. I’m sure I will always connect Cinderella Texas with Sandy, and that makes it special. However, when it finally is published, I hope it will make my readers smile, maybe even laugh. Well, at least you'll always remember this book and have a great little backstory to tell people about it. So what do you like about writing romances? I love happy endings, and I have always loved fairy tales. In my opinion, romance novels are that and more. The more would be humor. I love to read and write funny stuff. I came by this genetically. My father had a dry wit that made me laugh, but on his bad days, he only made me smile. We can all use the "medicine" of humor. I love to see it in the stories I read. What are some of the challenges you faced in writing your new book? The biggest challenge I had with Cinderella Texas and with all my books was polishing. I love to redo novels—look for another word, another sentence or another paragraph that will make it better. It’s hard for me to put my personal seal of approval on any of my books, sometimes almost causing a delay in sending out my final drafts to publishers. But of course, far the biggest challenge with Cinderella was getting it out there despite the storm. Yes, I can always find something else to fix or improve. Eventually, you just have to let go. What, for you, is your heroine’s most endearing trait or quality? Your hero’s? As mentioned earlier, I am a dyslexic. I once thought I was the dumbest kid in the state of Texas, my home state. So I made Alyson, the heroine of Cinderella Texas, an honor student. Nevertheless, she is like me in many ways. One of those ways was that she is a klutz. The hero calls her accident-prone, and I think she’s funny. To me, Alyson’s vulnerability is her most endearing trait. The hero has a dry wit—just like my dad. He is also a real cowboy just like my dad and my maternal grandfather. I like real men, and my husband is one. I also like cowboys. I disregarded the song that says, “Mama, don’t let your babies grow up to be cowboys” when raising our three sons. All three are cowboys today. And our six grandchildren? Well, they are cowboys, too, only three of them are girls. Ahh, nothing like a good, manly Texas man! Did you have to do much research for your books? No. I didn’t have to do any research for The Overcomers. I merely told what happened from childhood on. I didn’t have to do research for Cinderella Texas either. As I said, my father and my maternal grandfather were ranch managers, real Texas cowboys. What I didn’t tell until now is that I spent part of my growing up years on a sixty thousand acre cattle ranch in Texas, and sometimes other writers of western fiction ask me for background information on ranches and cowboys. Wow, that must make your "ranch fiction" especially authentic! And how does your personal faith impact your fiction? My born again Christian faith changed me for the good in every way possible. What was once a poor self-image, because of my learning disabilities, became a good one in the name of Jesus. How can I be a loser? I am a child of the King of the Universe. How can I feel friendless or persecuted? If God be with me, who can be against me? The theme of The Overcomers is this. I can do all things through Christ who strengthens me. That's something we all need to remember every day. What are some of the ways you weave faith into your fiction? God is responsible for every breath I take, and I cannot take even one more breath unless He wills it. So, weaving the Lord into my novels is easier than breathing. Do you feel integrating faith helps or hinders your connection with your readers? I write for a Christian blog called Commandment Keepers. So my Christian belief is available to anybody who does a search of my name on the Internet, and my Bible based Christian views might turn off some. However, my purpose for writing is not to tickle the ears or in this case, the eyes. My purpose is to make the Christian life real, perhaps punctuated by a smile. That's wonderful. Speaking the truth in love was Jesus's approach, and what better example could we have? So have your readers ever told you how your fiction impacted them? Could you share that with us? Some readers said my books made them smile, and that makes me happy. Others have said that my books made them think, and that makes me really happy. Is there anything special you’d like readers to know about you and/or your books that I haven’t asked about? We'll be looking forward to it whenever it comes out! One last thought? I love the Lord, and because of Him, I can also love everybody else. Thank you, Molly, for joining us. When Cinderella Texas is finally published, we'll make sure to have Molly back to celebrate! Till then, you can find out more about her at her web address. www.mollynoblebull.com Molly says, "My website hasn’t been updated lately, but that is on my “to do” list." Molly, I'm so happy you came to visit us at the Inkwell. I'm always impressed with the ability to write such beautiful fiction with dyslexia. I'm happy to know of your story and The Overcomers. I'll be watching for Cinderella Texas! Oh, yeah, I'm looking forward to Cinderella Texas, too. Just the title makes me want to read it! We're so glad to have you today, Molly! Molly, this is an amazing story. I'm always inspired when people conquer learning disabilities and follow their dreams.Thank you for this. I'll be watching for your book. I loved visiting with you folks. Thank you for having me. I left an earlier message, but it didn't go through; so I am sending another one. I think I mentioned that I love fairy tales, and Cinderella Texas is a retelling of the classic Cinderella story. I hope all of you will read Cinderella and my short story, D In For Dyslexia. 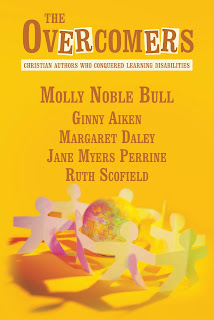 D Is For Dyslexia is in the current issue of Christian Fiction Online magazine. i will need to check out your D is for Dyslexia. my younger brother has dyslexia and is a very successful businessman. he is also extremely intelligent (which is ironic since people who didn't know about his learning disability would think he was dumb). he was so excited a couple of years ago when he read his first book - just to read it. he was so proud of himself it made me want to cry. i've always been so proud of him. because of my brother, i've always felt that people with learning disabilities are uber intelligent and their brain functioning on such a high level - it forgot how to deal with the mundane. my heart goes out to you for all the struggles i know you dealt with as you grew up. i'm so thrilled that you've found success as an author. i applaud your boldness about your Faith - so important nowdays. i'm looking forward to finding Cinderella Texas and reading it. thanks for visiting the Inkwell and sharing about everything. okay, back from reading the D is for Dyslexia short story. Heartwrenching for me, because I see my brother in it. It is wonderful too because, like the boy, my brother got someone (besides us in the family) to believe in him as well. great little story. i believe it will touch many and hopefully give another child hope. er... back again after checking Mollys web-page to find out i've already read some of her books!! the two titles pubbed in 1985 were purchased for me by my mom - who knew i was a voracious reader (and a teen looking for romance) and wanted to make sure the romance novels i read were uplifting and focused on God. i so remember those books and their covers. how cool is that?? ?